Most of the times, man-elephant conflict has resulted in the latter suffering, no matter the size or nature of the animal. One of the biggest victims of the increasing conflict are the elephants, who are fast losing their habitats and in some cases, lives. 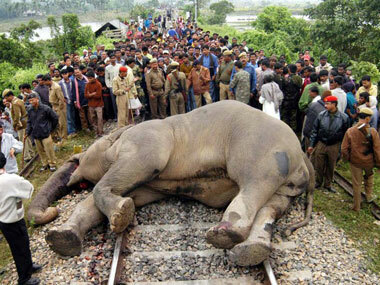 Data collected by conservationists has revealed that 40 elephants have died in Assam in the last 100 days. All of them have been killed due to unnatural causes, with the primary reasons being mowing down by moving train, electrocution, poisoning and accidentally falling in ditches especially in tea garden areas. Herds of elephants have been regularly invading human settlements in search of food, damaging houses and crops in the process. As a result, incidents of man-elephant conflict are steadily on the rise. “Elephants are considered to be a problem as they damage crops and properties during the harvest season. Also, unlike rhinos or tigers, elephants are not a state or national animal. Therefore, they evoke less public sentiment even when they die,” a conservationist, who did want to be named, pointed out. He added that while the public reaction is almost spontaneous in case of rhino deaths which are followed by strong condemnations and demands for exemplary punishment, the death of elephants fails to produce the same level of public outcry. “Unfortunately, we don’t see such outpouring of public support for elephants,” he said. There is an estimated population of 500 elephants in Assam, having habitats across all reserved forests. The state has five elephant reserves covering an estimated area of 10,967-sq km.